"Thomas Arnold McGlynn was born March 29, 1878, in San Francisco. After attending public schools there, he graduated from the Mark Hopkins Institute of Art. His class received their diplomas months after the 1906 fire had leveled most of the old school building itself. For Twenty-seven years Thomas McGlynn was an educator of note, connected with the San Francisco public school system and the University of California at Berkeley. He also taught classes at the Hebrew orphanage in San Francisco. McGlynn was one of the craftsman group gathered around his friend and former teacher, Arthur F. Mathews. For eleven years at the Furniture Shop, as Chief Assistant to Mathews, Thomas McGlynn was responsible for design of much of the art nouveau furniture and decorations used in Bay Area custom homes and in public buildings such as banks, theaters, auditoriums. An early hobby of McGlynn and his wife influenced their later life. Soon after both graduated from the Mark Hopkins Institute, they became active in helping the Boys’ Club, an organization something like Boy Scouts. The McGlynns, as leaders, often accompanied summer camping trips up the Carmel Valley, almost wild country at that time. Thomas was captivated by the quality of the air on the Monterey Peninsula, a certain kind of rarefaction which seems to heighten the tones of colors. He began making frequent sketching trips to the area, and in 1938 purchased a home in Pebble Beach for the family’s vacations. In 1945 they moved there permanently, the artist adding a studio of his own design. He retired from his teaching activities and devoted the remainder of his life to painting. Thomas A. McGlynn died on June 21, 1966. Thomas McGlynn had been an early member of the Carmel Art Association, and it elected him to its Presidency twice, as well as asking him to serve on the Board and making him a lifetime member. He was active for many years in other organizations: the Santa Cruz Art Association, the American Artists’ Professional League, the Society of Western Artists, the Society for Sanity in Art. His paintings often won prizes and honorable mentions at exhibitions given by these groups, and also at the Monterey County and California State Fairs. 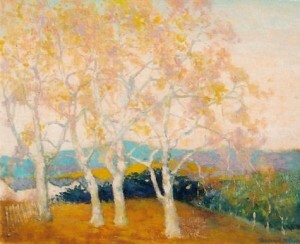 Paintings by Thomas A. McGlynn are among the most lyrical of the school of California Luminists. Almost completely a landscapist, the artist was able to convey in his pictures the poetry, the sense of majesty and tranquility which he sensed in nature. Never photographic, his works nevertheless express the spirit of the California coastside, from Mendocino to Santa Barbara".